Is It Possible to Find Quality IPS Monitors at This Price Range? Should You Consider the $200 Mark? Fortunate for us, we can find an IPS monitor under 150 with the current technology. Affordability is a great concern these days for users since monitors are a necessity if you own a desktop or even a laptop. Consumers expect to have all the latest features in their monitors and that too at the lowest price. Sometimes, in offices, for instance, the company has to buy plenty of monitors for their workers, and therefore they look for those brands which are offering most features in lowest price. Similar to that, IPS panel is now a standard feature found and is bound to be present in all the good monitors. It gives a better response time, and the display quality is far superior to the older TN panel technology. This detailed review will give you an excellent analysis of all the great yet affordable IPS monitors in the market, all in the price less than $150. This is a big concern especially for those who are going to try out the IPS technology for the first time. The thing is, IPS panel monitors come in several different qualities. The difference between the top-end and low-end is big. The top-end IPS monitors are much better than the low-end IPS panels monitors. Since the difference in quality is so vast, so is the price. Does that mean that IPS monitor under 150 are not worth it? Absolutely not. As a rule of thumb, IPS panel monitors will almost always give better visual quality than their same priced TN counterparts. Furthermore, had you asked a few years back, we would have advised taking IPS panels monitors with a grain of salt. Not anymore. With the current strides made with IPS technology, you can find good quality monitors at a price as low as $150. IPS monitor under 150 come in many different shapes and sizes. The most sought after size is the 24 inch. 23-inch monitors would also do. We will look at some of the latest IPS monitors under 150 that are available in the market today. 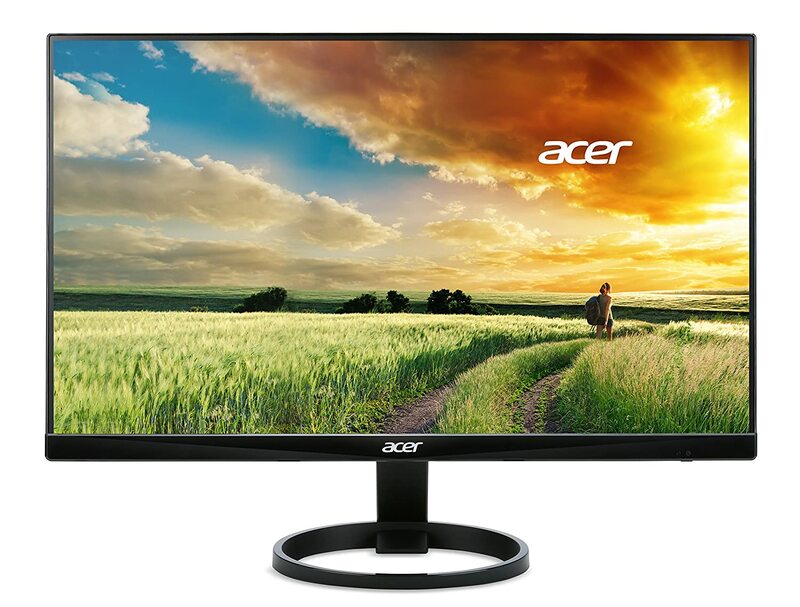 Acer’s 23.8 inch IPS widescreen comes at a very affordable price. It has a clear and wide display that shows everything the same way from every angle. 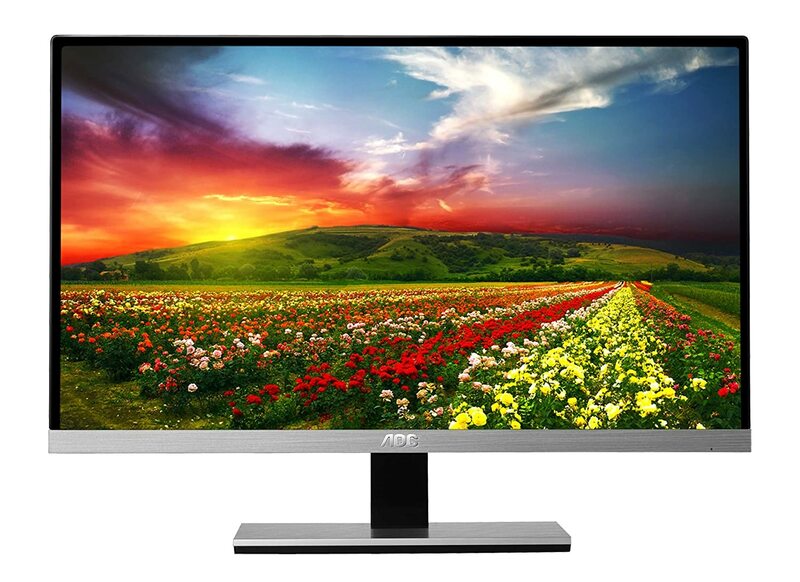 The monitor has a Full HD resolution and a contrast ratio of 100 million: 1. This ensures vivid color quality. The display has VGI, HDMI, and DVI input so that the screen can be attached to any device the user wants. A 1920 x 1080 resolution is ideal for playing different sorts of multimedia applications with perfect results. The design is very classy and has no frame which means that instead of one, two monitors can be placed side by side without affecting the continuity. The monitor also allows for a little tilt from -5 to 15 degree giving a better view to the user. IPS display provides excellent colors and fewer disruptions due to a quick response time of 4ms. The customer reviews were great in which about 71 percent of the users gave it a full 5-star review. From the perfect packaging to faultless display and high viewing angles, everything was up to their desired levels. The only downside, however, was that it was not compatible with VESA plate, meaning it could not be mounted on a wall. Other than this, an extensive list of features was present in this product. This is a 23-inch display coming at a price of just under $150. It’s borderless feature adds to the class of the monitor and IPS panel makes it more appealing to customers. It has a high resolution of 1920 x 1080 which is full HD standard for gaming demands. The response time is of only 5ms which is quite fast. Port compatibility is fit for 2 HDMI and one VGA input. The stand which comes along with the monitor is detachable so you can use it both the ways. Another attractive feature for many people is that the screen has a matte finish and will not get dirty with fingerprints. With just one cable the audio and video can be connected to devices like phones and consoles. Among the users who bought it, many gave it a full 5-star review. They loved how the monitor was so slim that it hardly took up any space and was also easy to mount on the wall. There was also no issue of light leak from the sides. Many of them were happy with all that they got at such a low price. This list of IPS monitor under 150 would be incomplete without the mentioning of this quality screen. 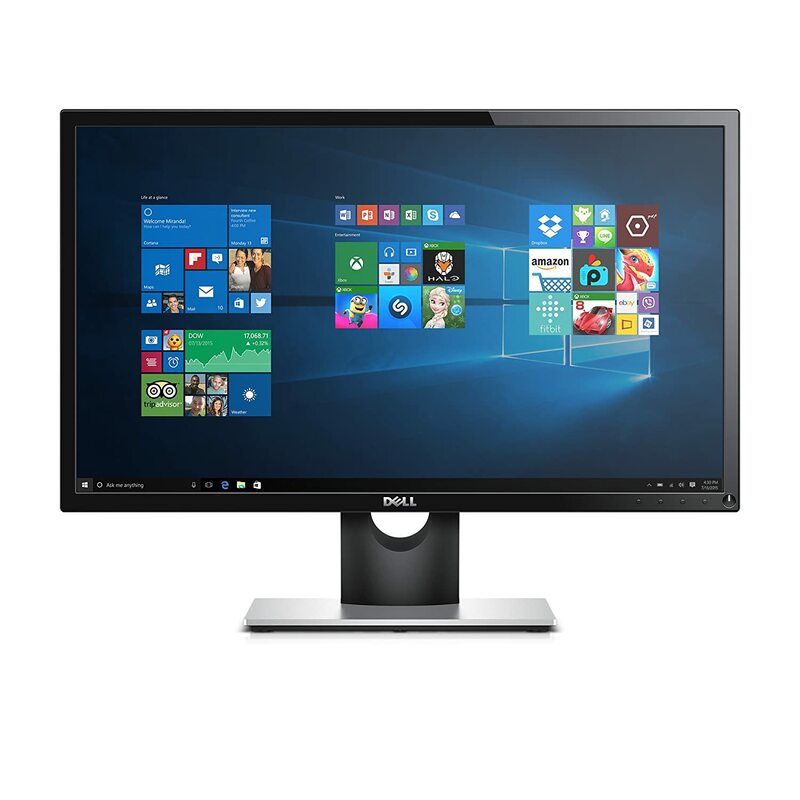 Dell has undoubtedly done a commendable job with their sleek and slim 23-inch monitor at a price lower than $150. Discussing the outlook first, it is painted black, and the stand is made of aluminum giving it all a classy touch. The stand, along with its design, has a strong built and doesn’t face the issue of being unstable. A full HD display and resolution of 1920 x 1080 gives impressive results without any brightness or contrast issue. Furthermore, there is a 178-degree viewing angle which means people sitting far apart will get the same uninterrupted view. PowerNap feature puts the monitor into sleep mode when it is idle for a certain time and this along with the energy star helps to reduce the power consumption. Setting buttons are at the bottom for quick control. Moreover, the HDMI/VGA ports make further connectivity easy. Customers were disappointed due to the lack of VESA compatibility. 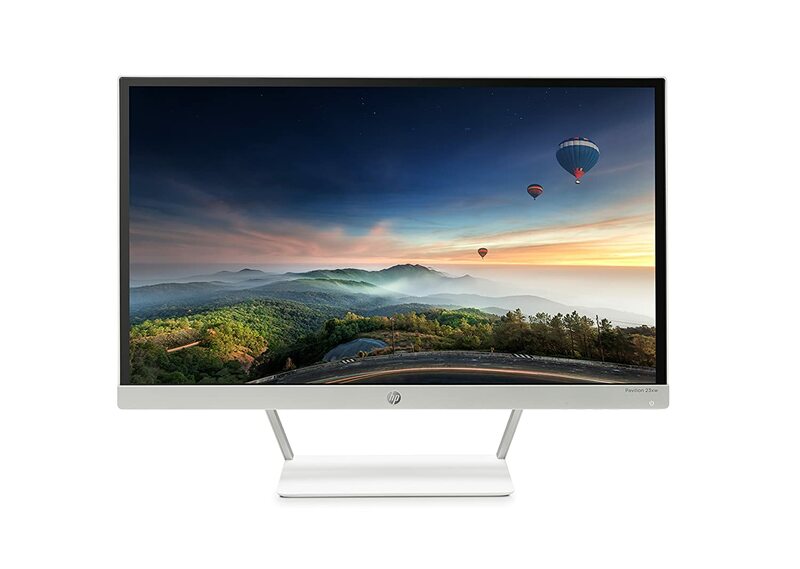 HP, yet another renowned brand in the world of technology, has targeted the middle-class buyers with their fantastic yet affordable monitor. This monitor features an IPS panel on a very stylish display. The overall look doesn’t lack behind than any other IPS monitor, for instance, the white and silver combination lifts up the whole design making it ideal for almost any environment. For the price, this IPS monitor under 150 offers so much. The usual 2 HDMI and one VGA port provide excellent connectivity. Other than this the energy star means that it consumes comparatively less power making it ideal for office environments. HP earned the reward for its effort when about 76 percent of the users gave it a full 5-star review. Comparing it by looks; everyone loved it better than others in the competition. Color display was excellent, and the menu was very easy to use, without any unnecessary complications. Lenovo hasn’t stayed behind in the race of manufacturing affordable IPS monitors. It has come up with a gorgeous 23-inch display at a price of just under $149. Apart from the classy and appealing look, the frame overall is durable, and the stand is built from high-quality material to ensure the monitor stays stable in its position. Also, the tilting hinge allows the user to adjust the angle according to his/her requirements, adding more points to the pro side of this product. The Neo-blade panel makes it ideal for setting even two monitors side-by-side. The reviews were pretty good as about 62 percent of the users gave it a full 5-star review whereas from the remaining, half of them gave a 4-star review. Customers were happy with the slim, sleek design and sharp image display which didn’t give much strain to their eyes. Those who placed it in their offices said that the classy design made their workplaces look clean and stylish. While many of the users were extremely satisfied with quality and design, many said that the brightness was a huge issue. Other than this, LENOVO did a great job. 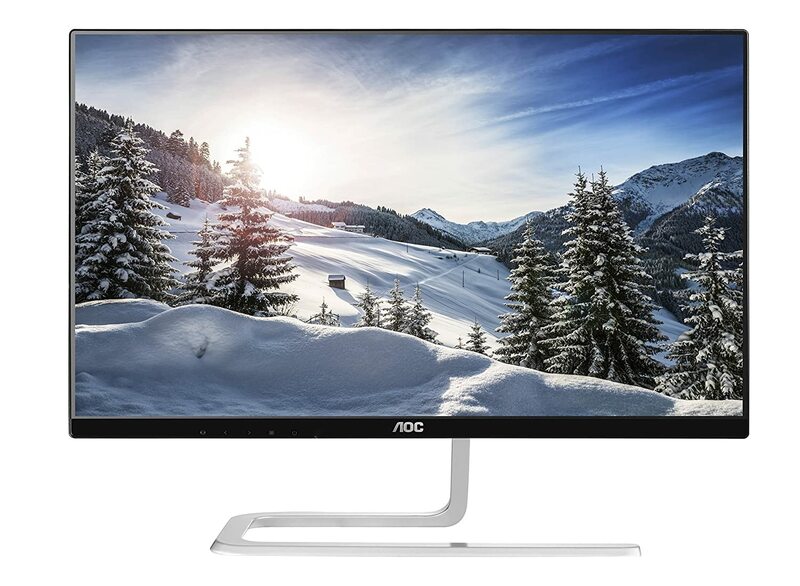 AOC’s 24-inch display with IPS panel comes at an affordable price of under $149. This super sleek design is all you want to have as your monitor, with an ideal brightness and contrast ratio. Image display is further perfected with full HD resolution of 1920 x 1080 pixels. Dynamic Contrast Ratio allows even the darker colors of the visual to be displayed with great depth. In terms of the slim bezel, this is one of the best IPS monitors under 150. Kensington security slot is a great attraction in these monitors which allows the user to protect the monitor via a cable kit and therefore prevent it from all sorts of theft. Connectivity wise, this monitor offers HDMI and VGA ports. As is evident from the reviews above, you can find some amazing deals at this price. IPS monitors under 150 are not just affordable, they are also very well built and suitable for multitude of tasks. Furthermore, most of these monitors offer beautiful looks. This is a phenomenon that has started thanks to IPS panels. They look much sleeker and have slimmer bezels adding to the aesthetics.